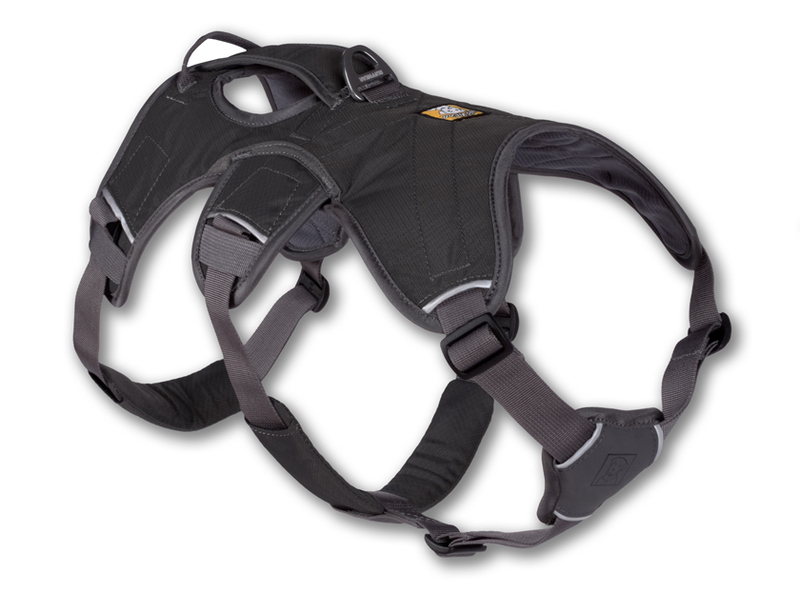 Not only is this a great all-around harness; many swear by it for keeping their dog from backing out. We also get great feedback from owners of older or disabled dogs. 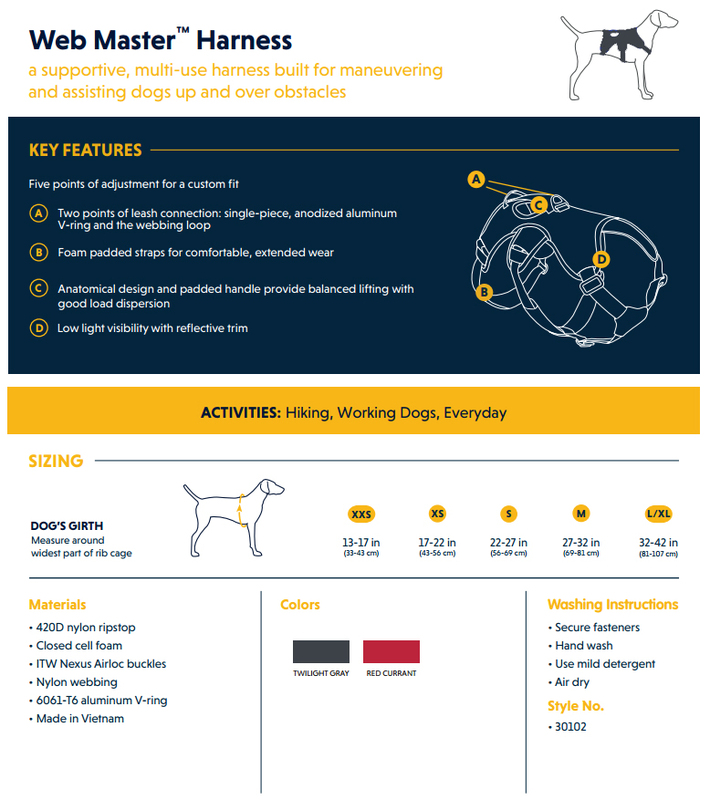 Ruffwear's Web Master Harness is a supportive, multi-use harness for dogs built for maneuvering and assisting dogs up and over obstacles. 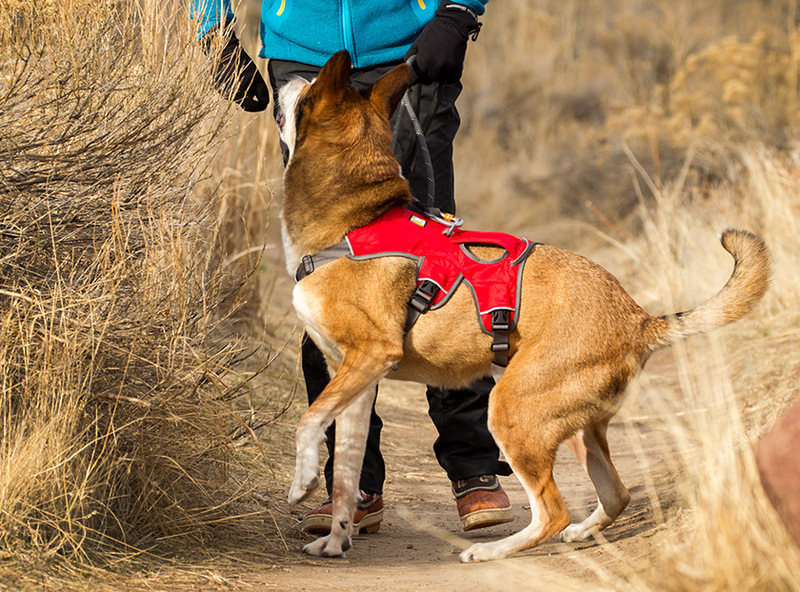 While great for assistance, this harness is also a great collar alternative and is ideal for biking, hiking, scrambling, and everyday use. 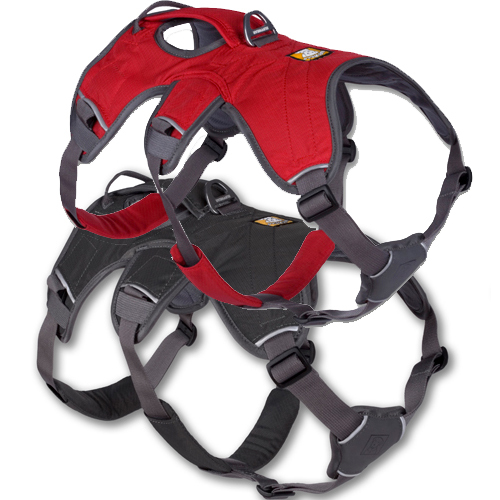 The Web Master is the preferred dog harness used by many avalanche rescue dog teams in the United States. 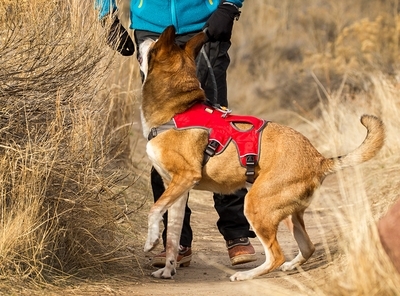 This harness is a great collar alternative and is ideal for biking, hiking, scrambling, and mobility assistance. "Thanks for the quick delivery of my order! The harness is exactly what I need to help my 10 year old golden get up and get his legs under him when he first gets up. I think will allow us to keep up his mobility longer! Thanks again", Shari D.
I got the items I ordered in two days --- pretty amazing turnaround time! 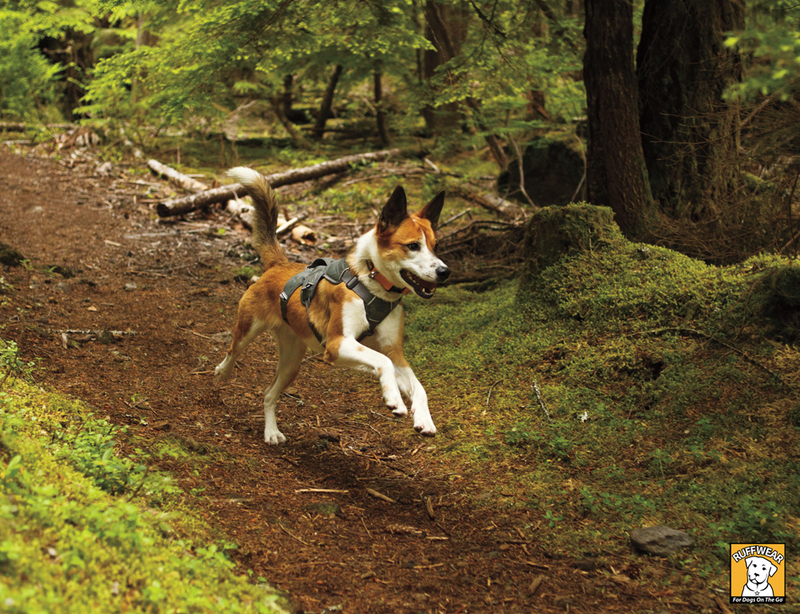 The RuffWear harness is a godsend. Sadie cannot get out of it, and she seems to be saying, �Wow, Mom. This is way more comfortable for me to wear while exploring and snarfing around. I can change directions with you, and there�s no pressure on my ribs. Thanks!� It was easy to put on, and our rides are a lot safer and more fun. On the second day out, I made use of the handle to extract her from a bush where a suspicious creature was lurking, so that�s a really big help. Well designed and well made. It really is worth the extra money. Yesterday my Ruff Wear Harness came for my puggle and i absolutely LOVE it!!! AMAZING!!! Fantastic quality and from the moment i put it on her she loved it. Most importantly i have piece of mind that she wont back out of it or her front paw wont come out of it. We strictly wanted this harness for those purposes, Corduroy is thankfully a very healthy 7 mnth old puggle. As first time dog owners, we just needed a super duper "trap proof" harness that she could not get out of. I want to thank you for helping me out, answering my questions and concerns and also for the extremely fast shipping. I was anxiously waiting for the harness to come, imagine my surprise when i came home and my wife told me it had arrived. Once again, the best harness i ever saw, absolutely love it! But the peace of mind knowing that when we drop Corduroy off at my moms in the morning to go to work that we know she is totally safe and secure... no one can put a price on that! Thank you again, and i will defiantly recommend your website to friends. "I just wanted to tell you I received my order yesterday and I am very happy with the items I purchased. The Ruff Dog harness fit perfectly and only took a few minutes for my dog (Ex) to get use to it. 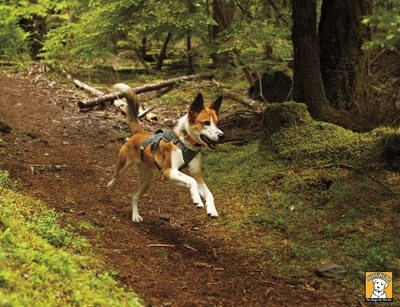 We plan on using it during his tracking training as well as mountain biking. We also tried out the WalkyDog bike leash for a little while yesterday and he loved it. Unfortunately while training with Ex yesterday on recall drills he injured his back paw and can't do anything physical for at least the next 10 days, so our bike riding is going to have to wait until he heals. "This fits my front leg amputee tripawd PERFECTLY. She can't wriggle out of it and while it does slide to the side it is easily readjusted. Love that I can pick her up with the handle when she's tired, stubborn, or I need to get her up on something high (table at the vet, etc.). She's an energetic two year old and this also prevents her from choking herself when she dashes down the hall to get out the door!" 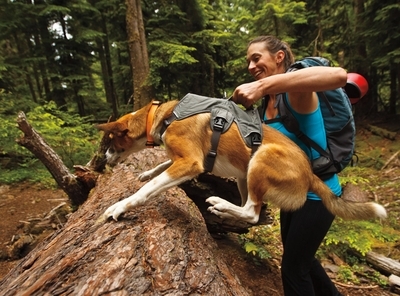 "We love this harness. Raven is a service dog, a Diabetic Alert Dog for our 10 year old daughter. The Web Master fits perfectly, and we have it all sewn up with patches. We love the high visibility of the red. This is perfect for our needs, super well made, and the cost is reasonable." "Our dog is a 18 lb escape artist and we have spent a few hundred dollars on different harnesses and he got out of all of them! The Webmaster harness is not only made well but we feel very comfortable that he will not get out of this one!" "Louise has had multiple surgeries on her elbows and hips, so this harness really helps with mobility. She's 15 with heart of a pup and this harness helps her enjoy walks in the woods, her favorite thing (after time with her person/mom)."